St. Louis police Lt. Timothy Sachs says he could see protesters meant trouble because they were wearing goggles, masks and backpacks. This was hours before police corralled and arrested 123 people downtown on the night of September 17, a now infamous incident known as the "kettle." Protests were in their third night following the acquittal of ex-city cop Jason Stockley on charges he murdered Anthony Lamar Smith. 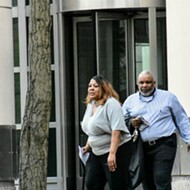 Sachs, who oversees the department's Civil Disobedience Team or "riot police," testified during a federal hearing on Thursday there had been vandalism earlier in the evening — broken windows, overturned flower pots, furniture dragged into the street. And he saw a group of people coming onto Tucker from the direction of the destruction. 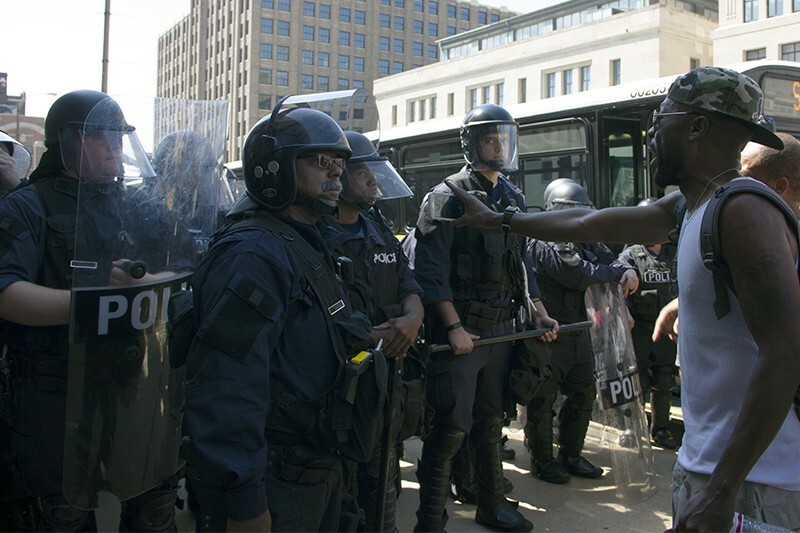 When confronted by police, they donned goggles and pulled masks over their mouths, "indicating to me they were wanting some kind of confrontation," he said. Police in an armored vehicle chased after the protesters, lighting them up with pepper balls — which are like paint balls, only they're filled with pepper spray chemicals. 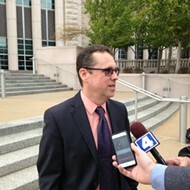 Attorney Tony Rothert, legal director of the American Civil Liberties Union of Missouri, questioned Sachs about his interpretation of protesters' intentions during a cross examination. "Surely, no one could provoke you to use chemicals by wearing something, could they?" Rothert asked. The lieutenant assured him they could. 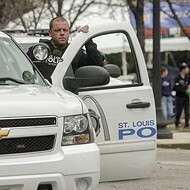 The admission came as Sachs and other St. Louis police supervisors, including Sgt. Brian "Riot King" Rossomanno, spent the afternoon defending their response to the demonstrations since the Stockley verdict on Sept. 15. The ACLU is suing the city on behalf of protesters and others, who are also seeking an injunction to reign in police tactics. The hearing began Wednesday with sixteen ACLU witnesses who described violent encounters with officers. The majority said police freely used mace, teargas and other chemical deterrents, often without warning. Air Force Lt. Alex Nelson testified he and his wife were just walking on their block when they were caught in the kettle and arrested. Officers ground his head into the pavement and blasted him multiple times in the eyes with mace, even though he complied with all commands, he said. "A police officer in a laughing tone said, 'Do you like that, cocksucker? We'll see you again tomorrow night,'" Nelson testified on Wednesday. On Thursday, police denied any excessive force and claimed all their actions were warranted in response to destructive or potentially destructive protesters. A main point of contention is the police authority to declare assemblies unlawful, order crowds to disperse and then make arrests. Under questioning by Rothert, the police officers struggled to define factors they use to determine when they think it's time for protesters to leave. Equally vague are parameters for how far people are supposed to go and how long they have to stay away. "I don't believe there is any line in the sand, if you will," Sachs said. "It all depends on the people involved." Sgt. Matthew Karnowski of the city's bike unit said the area of dispersal depends on the situation: "I guess that has to be grounded in common sense." Rossomanno said, "I think when police say it's time to leave the area, a reasonable person would decide to go ahead and leave." The ACLU contends that police who are left to their own interpretations make some pretty sketchy judgment calls. One of the incidents discussed at length during the hearing came on the first night of demonstrations. 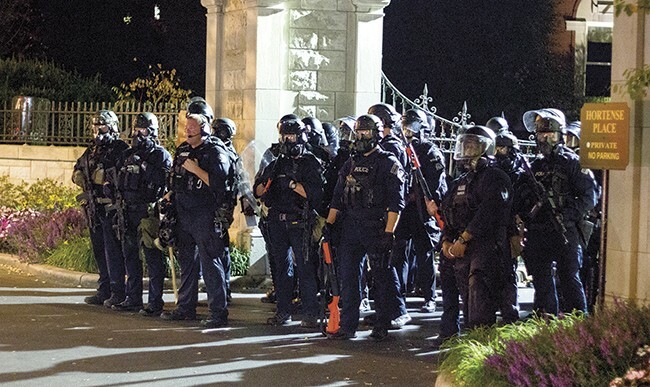 Following earlier vandalism at Mayor Lyda Krewson's house, police in tactical gear marched north on Euclid Avenue firing pepper balls and smoke bombs as they went. Sgt. 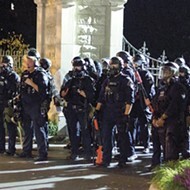 Brian Rossomanno (center, no helmet) stands with riot police on Sept. 15 at the edge of Euclid Avenue. Pi Pizzeria owner Chris Sommers testified on Wednesday that protesters had cleared the area, and he couldn't understand why cops in full riot gear were storming the restaurant district. He shouted at them. Moments later, Rossomanno threw a smoke canister that skipped toward the curb in front of Pi. Sommers said they were aiming at his business, but Rossomanno denies it. The sergeant testified he was actually trying to throw it farther up the street toward a few rock-throwing stragglers from earlier protests, but the canister came off his hand at a bad angle. "It wasn't one of my better throws," he said. A guy next to Sommers picked it up and heaved it back, attracting the sergeant's full attention. "It made me want to take that person into custody," Rossomanno said. When Rothert asked him why, the sergeant said, "That's an assault." A SWAT officer responded by firing a round of pepper balls at the man. Sommers said he, his customers and staff had to take cover inside the restaurant until police eventually retreated south on Euclid. The ACLU attorneys have argued the incident is an example of overly aggressive policing that puts protesters and bystanders in harm's way. 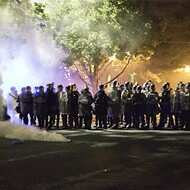 The night of the kettle, police commanders began ordering people to disperse following a vandalism spree that occurred between 8 and 9 p.m. None of the supervisors who testified on Thursday could specifically point to any of the actual window breakers, but they said they had begun to identify people who they believed were in the vandals' crowd. When Sachs saw people coming from the east, he suspected they were with the troublemakers. He became even more certain when they pulled on their goggles and face masks. "They started reaching into back packs," Sachs said. "We didn't know what they were doing." Protesters and journalists have regularly worn goggles and masks to protect themselves from mace and teargas. Police say they know of no more vandalism that night, but they continued to confront crowds of people during the next two hours, occasionally ordering people to disperse. In signed statements submitted by the city's attorneys, police claimed they gave a final order to disperse at about 10:50 p.m. But Sachs said he has since reviewed radio calls that show it was actually 11:01 p.m. Rossomanno, who was in charge of giving the dispersal orders, says he gave a couple dozen warnings throughout the night. His signed statement says the last was at 10:50 p.m., but he testified that a city counselor wrote that for him and the final orders were probably later. A line of bike cops formed at the east side of the intersection of Washington Avenue and Tucker Boulevard. Sachs said that two of three teams of riot police moved into position on the north and south. By his account, about 25 minutes passed between the final warning and when his third team reached the intersection, closing off the west exit and boxing in everyone who was left inside the intersection. Protesters have argued people walked in and out of the area during that time, many of them oblivious of police warnings. A total of 123 people were arrested. Citing police sources, the St. Louis Post-Dispatch reported an undercover officer was among those knocked down, bloodied and taken into custody. 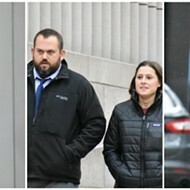 Sachs and Rossomanno claimed to know nothing about what happened to the undercover detective. Sachs said he never looked into it and hasn't inquired about him. "The man doesn't work for me," he said. 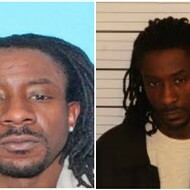 Rossomanno said all he knew was that he had heard the detective was actually taken into custody before the mass arrests. "I heard that there was some sort of resisting," he said. "That's all I know." Video exists of the minutes after police boxed in the crowd at Washington and Tucker. Panicked people searched for a way out, even trying to get into nearby buildings. In the background was the sound of cops drumming batons against the ground in unison. Some of the people had already dropped to the pavement by the time police move in with cans of pepper spray. Independent journalist Jon Ziegler, who goes by Rebelutionary Z online, had his livestream camera running as officers shot him with mace and arrested him. Viewers could hear him screaming in pain before his feed went dark. 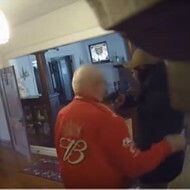 He testified Wednesday he was sprayed at least six times by officers, who he believes singled him out for extra abuse because of his video recordings. "They continued mocking us, calling me names, taking selfies with me while I was just dripping with snot," he said in court. Police testified they saw nothing wrong with the arrests and witnessed no acts of excessive force on the part of cops that night. Sachs and Rossomanno said that a couple of people resisted arrest, forcing officers to fog the them with mace. Videos by Ziegler and a videographer named Demetrius Thomas, who was also arrested, show people voluntarily going to the ground. Multiple people testified they heard no orders of disperse before they were surrounded. They claimed they were assaulted, even though they complied with all orders. Rossomanno said police used only the force necessary: "People who were 100 percent compliant had no issues at all." Protesters listening in the courtroom shook their heads.